Normally I am not tho.e type of person to talk about make up. To be perfectly honest I am not that good at it. I don't really wear the stuff unless I am modeling. I didn't even really learn how to do basic techniques well until about 2 years ago. Anyway....one of the biggest issues I have always had is finding a foundation that really matches my color. I am pale and I swear the color is either to light or to dark with nothing in between for me to use. Very frustrating! I know that I am not the only one who has this issue but I am happy to report that I have found the solution. The other day I took a trip to Lansdale to visit Delia's Makeup & Theatrical Supplies . I had received a gift certificate and decided to go and check it out. I felt like a kid in a candy store. They have some of the coolest make up colors I have ever seen and the owner, Delia, is a wonderfully awesome person. After taking everything in and her trying to help me figure out what I wanted the conversation turned to foundation. This is when I found out that she will actually mix a foundation just for you that will match your skin perfectly. Every now and then an opportunity comes along that you want to try but you just aren't sure about it. This is what happened to me when I saw a post asking for a model for a body painting competition. Some of you may be wondering what the big deal is. 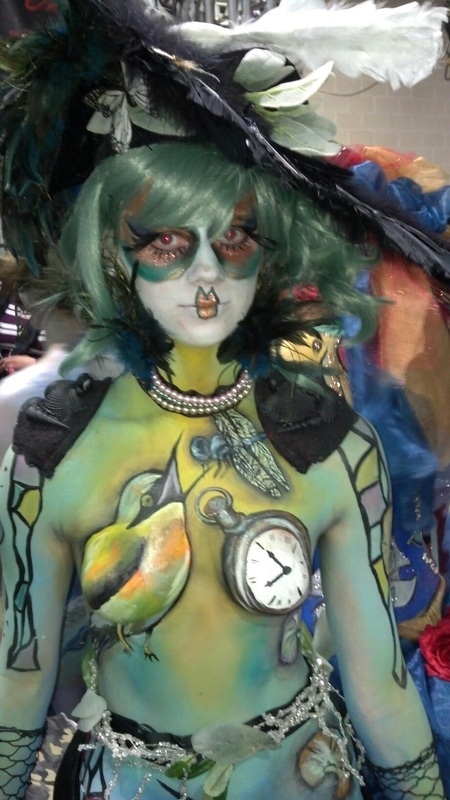 Well this competition was to take place at the Philadelphia tattoo convention in front of hundreds of people. This was a live event! As in people could watch me be painted! Kind of scary right? Anyway, I decided that I was going to give this a shot. I mean what was the worse that could happen, right? I finally got to meet with my artist the night before. She is from NY so we only had one night to practice together. Let me tell you she is one of the nicest people I have ever met. So full of energy! Her husband was wonderful as well, helping keep her on task and giving encouragement. Needless to say she was nervous. I mean this was a huge deal for her! Right then and there I put on my brave face. I made sure to keep her confidence up which was easy because she is very talented. I would not let her know that I myself was a little anxious at the thought of what I was about to do. We ended up coming in 2nd place and won the peoples choice award. It was wonderful and I felt accomplished for doing something that was out of the norm for me. I would say that this time it was totally worth it to step outside of the box. Sorry it has been so long but as we all know life happens and things get busy. I thought I would pop in with a quick update of what is going on in my career. About two weeks ago I had the pleasure of working with Lee and Ralph from Steampunk Works and Karen from KVO Designs at the Macrabre Faire in NY. It was a wonderful show where I was dressed as a queen vampire.It was so cool! I mean everyone wants to be a queen but a queen vampire is like awesome. Other then that I found out that I made it into the Pin Ups for Felines Book. The fact that I made it into there calendar and book was very thrilling for me. Of course major props go out to my photographer Lynn from Untamed Photography. I am very lucky to work with all of these wonderful people. They really are so nice so please check them out. We all need support no matter whether we are models, photographers or designers.